Fix-It Driver Repair Tool automatically identifies the drivers requiring updates and provides you with the most suitable choices to enhance your system's performance. Get automatic "updated driver" notifications and install in just one click. Fix-It Driver Repair deletes and backs up installed device drivers for your computer, giving you peace of mind. Fix-It Driver Repair saves all of the driver updates and install history, making it an extremely safe hard disk repair software. 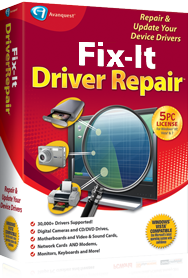 Fix-It Driver Repair Tool allows you to create a system restore point before installing new drivers in the event you want to revert back to your old driver.